Like the Model T, the electric variant E was in 1936 with the "sliding quotient circuit" and sold under the designation EK. Externally, however, there were hardly any differences to the previous model. 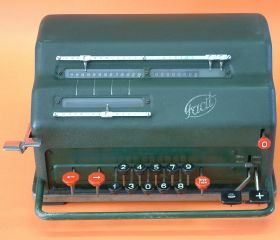 In 1943 Facit AB has the color of the housing changed from black to "Halda-green", built an improved drive unit and changed the name in NEK.